I am a firm believer that breakfast must never be skipped. Some of my favourite breakfasts have been at hotels – there is something just so great about a grand dining room with a vast variety of breakfast dishes to choose from. After all, how you start your day pretty much sets the scene for the day! It is also nice sometimes to treat yourself rather than cook breakfast at home. We popped into the Waldorf Hilton early one weekend morning for breakfast. It was served in a gorgeous room that was filled with rows and rows of beautiful food. I particularly adored this cute juice cart! 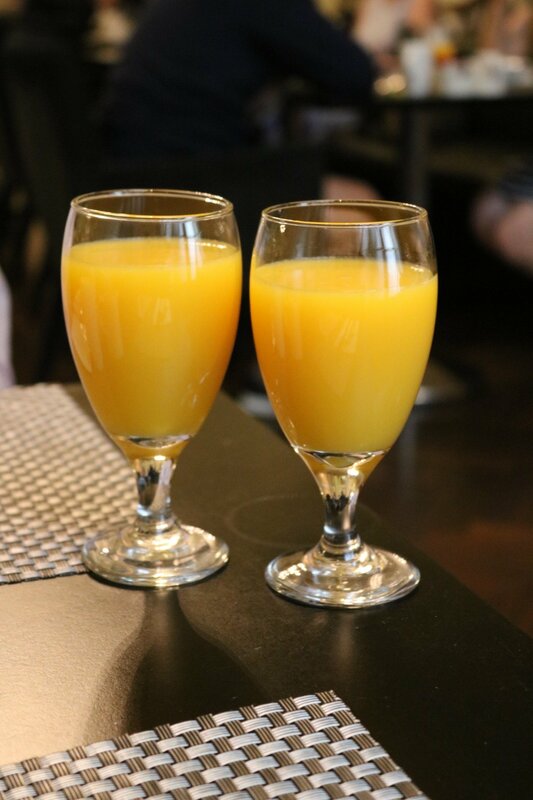 As soon as we were seated, our tea and coffee orders were taken and we were given glasses of freshly squeezed orange juice, which was such a fabulous touch, especially as they were bottomless! So refreshing and so delicious. The breakfast menu had a really good choice of breakfast items categorised by The Continental, where you could pick items from the buffet, the Full English, items which are also available from the buffet, and Breakfast Favourites, where classic cooked dishes, both sweet and savoury, are present. Amit had his heart set on the Full English and so filled his plate with all his classic favourites from the buffet. There was so much choice in the buffet! I was torn between a sweet or savoury breakfast but decided on Eggs Benedict in the end. I think I am a little predictable anyway! I would love to try some of the other items on the menu next time. I really loved the buzz in the breakfast room and the waiters were really delightful, being attentive but not intrusive at all, so we were able to relax and enjoy our time there. You could have your breakfast with a glass of Champagne, Bloody Mary or Mimosa too but I decided to behave as it had been an indulgent few days. If it is a special occasion or treat this would be perfect. My eggs benedict was amazing and I tucked in with a big smile on my face. It was a really generous portion and served with a grilled tomato on the side. I know Amit enjoyed his Full English Breakfast as it was devoured speedily! With his selection he had picked scrambled eggs, and they looked so fluffy and he confirmed that it was delicious. The food was incredible and is a lovely spread. We really enjoyed our breakfast and our morning at the Walforf Hilton, which is such a beautiful hotel. The Waldorf Hilton is located near Covent Garden and so would be a fantastic place to start the day pre-shopping or as a celebration or treat. It is actually really pleasant walking through Covent Garden early in the morning as it is so quiet and tourist free. If you are looking for a fabulous breakfast venue the Waldorf Hilton is perfect! For more information visit their site here. Our breakfast was complimentary but all views and opinions are my own.